Anyone who wants to meet others while enjoying a common activity is welcome to join a SSUC Small Group. Members of Small Groups find friendship and opportunities for casual conversation about important matters like social justice, and spirituality. Small Groups are one way people find that they can be church to and for each other at SSUC. Signup sheets will be available the first 2 Sundays of September, 2018. You can also sign up by emailing either Barbara Parrott or Sue Doerksen . Co-ordinators: Barbara Parrott 613-389-3601, Sue Doerksen 613-766-3254. Small Group Ministry has been a long-standing feature of our church life. It is a way to join with others in the pursuit of common interests or spiritual development. 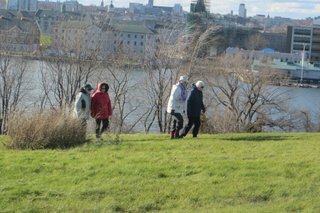 Some groups meet monthly, some more frequently. Small groups will start anew this fall; some new groups are in the early stages of development. Check the weekly bulletin for more information about the small groups available at SSUC. 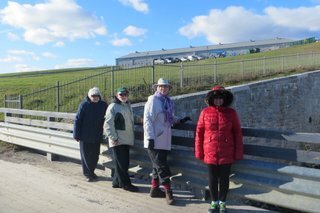 Please feel free to contact Sue Doerksen (613-766-3254) sdoerksenca@yahoo.ca / Barbara Parrott (613-389-3601) parrottb@hotmail.com If you have an ideas for a new group we would love to hear about it. The next meeting will be at the Best Western Bistro Stefan Restaurant,1217 Princess St. Our speaker will be Col. Kirk Gallinger, Base Commander, C.F.B. Kingston. The title of his talk is Canadian Forces Base Kingston: A City within a City. Everyone from Sydenham St.U.C. and Chalmers U.C, is invited to attend. Individuals on call lists will be contacted by email. Others wishing to attend and/or to have their name added to our call list, please contact Donna Delyea at <delyead@live.com> or 343- 364-1758 before 5 pm on Sunday, April 7. The cost for the luncheon, incl. tax & gratuity, is $22. per person (a $20 bill plus a toonie, please). 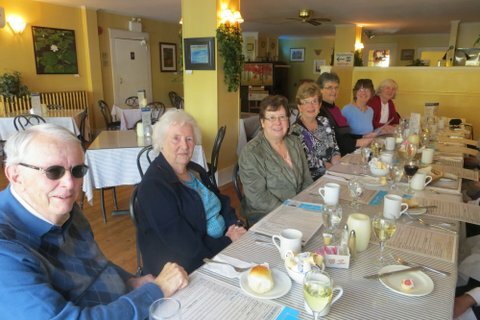 Join members of the congregation for a casual lunch at an area restaurant. Enjoy food and fellowship with us once a month. The Evening Book Group meets on the final Tuesday of each month to discuss a book we have all read, and share conversation, goodies and fellowship. Our meetings are in the homes of our members. We collaborate to choose our monthly reading, ideally using book club sets from the Kingston Frontenac Public Library. Our next meeting will be on Tuesday, October 25. Contact Ellie Deir for information about our group: deire@queensu.ca. 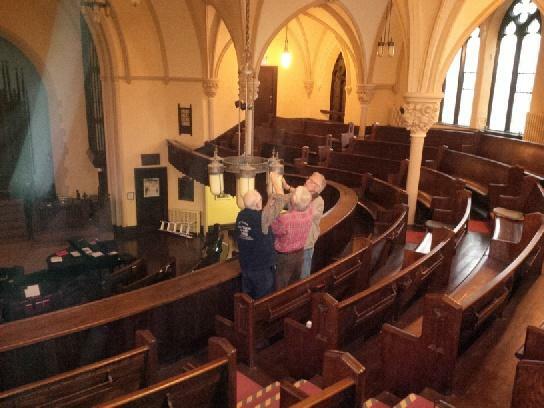 The Community Garden was a student run project, which worked in partnership with Sydenham Street United Church. 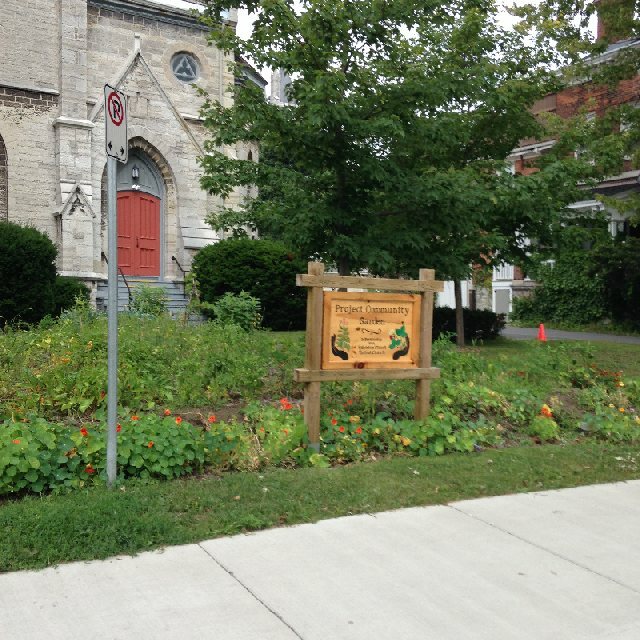 The summer of 2014 was the first growing season, in which we grew a variety of heirloom vegetables and herbs, on a 42ft by 21ft plot located on the front lawn of Sydenham Street United Church. It has now been taken over by the Community Gardeners of Sydenham Street and the produce is donated through Loving Spoonful to help provide healthy meals to individuals and families who might not have access to fresh fruits and vegetables. For more information contact Nancy Spencer at 613-548-3579. We have formed a Prayer Shawl Ministry group, which will be meeting generally every 2 or 3 months on a Friday from 11:00 – 1:00 in the Chapel. 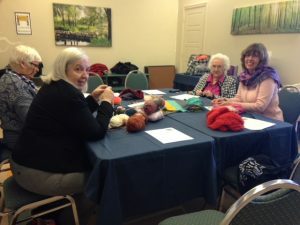 This time is set aside for knitting/crocheting together, prayer, tips on instructions and technique, and conversation. Everyone is welcome. Coordinator: Sue Doerksen, sdoerksenca@yahoo.ca 613-766-3254…more information. 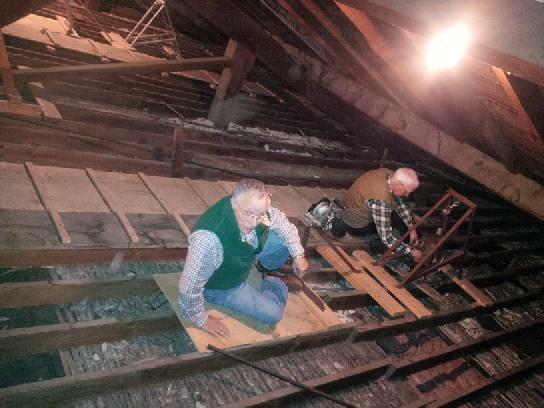 The Fixers meet on Thursdays from 1:30 – 3:30 p.m. at the church for a time of work and social interaction as we do those small things that make our church space safer and attractive. For more information contact Kenn Doerksen at 613-766-324. “How many people does it take to change a light bulb!